Clear statues in Lion Square. Clear statues west of Calvary Way. (Order optional): Clear statues east of Calvary Way. Clear statues to Eastgate, including NM Wyrmgnasher Bjakdek. Clear statues along north side of Victory Square. Silence Vanguard's Hecteyes. (Order optional): Clear statues at Auction House. (Order optional): Clear statues leading to Chocobo Stables. Clear statues to Westgate, including NM Reapertongue Gadguok. (Optional): Clear statues to Pikeman's Way. Silence Vanguard's Hecteyes. (Optional): Clear statues to NM Voidstreaker Butchnotch. 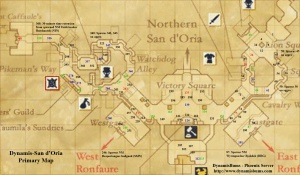 (Optional): Clear statues to Watchdog Alley. Clear respawned statues in Victory Square. Camp in front of the Auction House. 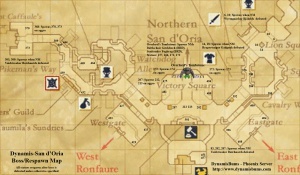 Camp should be far enough north from the Auction House to avoid single respawning statue on the top level (501), but far enough south to avoid respawning statues in Victory Square (475-494) after Overlord's Tombstone is defeated. 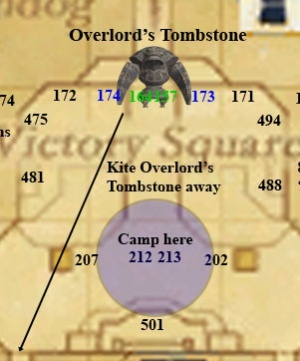 A player with increased movement speed pulls and kites Overlord's Tombstone through previously-cleared areas. Melee alliances sleep and defeat spawned Vanguard Impalers (3 total) and Vanguard Dollmasters (3 total) from Warchief Tombstones 157 and 164. Defeat accompanying NMs Battlechoir Gitchfotch and Soulsender Fugbrag. These NMs may resist sleep (Elemental Seal may be required). Defeating Overlord's Tombstone does not grant a time extension. Fanatic Dance from Orc NMs can be mostly avoided by using a sleep-nuke strategy, rather than allowing players to melee. Melee alliances should move away from the Orc NM being fought to avoid being charmed if accumulated TP from magic damage allows Fanatic Dance to be used before it can be slept again. Vanguard's Hecteyes cast Dispelga often. Hecteyes should be Lullabied and Silenced away from the main alliances while fighting other Vanguard. (Smaller groups) Many of the pulls in this zone are unnecessary to prepare for defeating Overlord's Tombstone. This page was last edited on 13 August 2017, at 03:01.